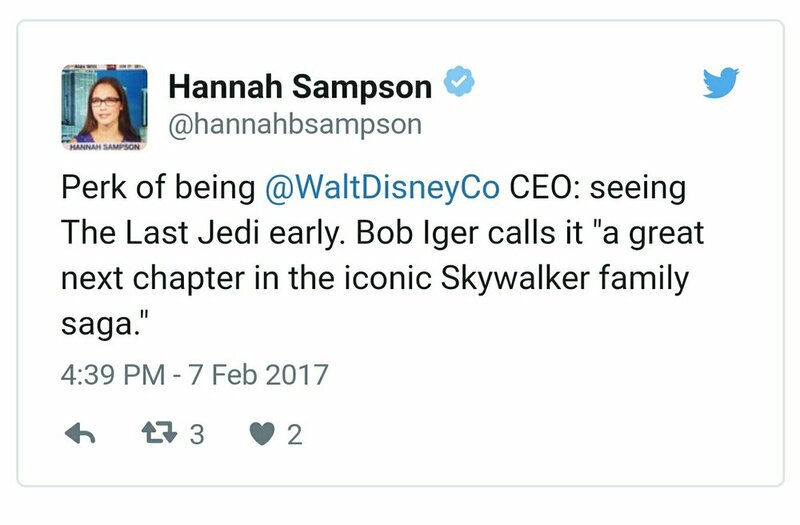 Disney CEO Bob Iger Has Seen 'Star Wars: The Last Jedi' & Here's His Thoughts! With all Star Wars fans anticipation levels right now being through the freaking roof for their first glimpse of anything Star Wars: The Last Jedi related. One very lucky person has already seen the finished film and that is none other than Disney CEO Bob Iger! Sounds like he liked it! Of course he has to say that and of course he has to be very cool about what he says. He can't describe how much he liked it in too much detail or fans will quickly dissect his words and use them out of context. Stay tuned for new on director Rian Johnson's highly anticipated film, Star Wars: The Last Jedi right here at EastCoastMovieGuys. While you're here, let us know your thoughts in the comments section down below. As always, thanks for stopping by! Star Wars: The Last Jedi is set to hit theaters on December 15th, 2017.